Cooking a whole turkey is a daunting task for both novice and skilled chefs alike. The size of the bird is intimidating, of course, but there are also family expectations, holiday traditions, and a whole host of other factors (such as having to cook several other dishes at the same time) that can overcomplicate matters. While we can't help you referee any family drama, we can show you how to cook your best ever roasted whole turkey with confidence. This may be one of the more unnerving steps when it comes to cooking a turkey—how big does it need to be? The general rule of thumb is one pound per person. But if you would like leftovers or have a few big eaters in the group, you'll want to increase to 1 1/2 to 2 pounds per person. 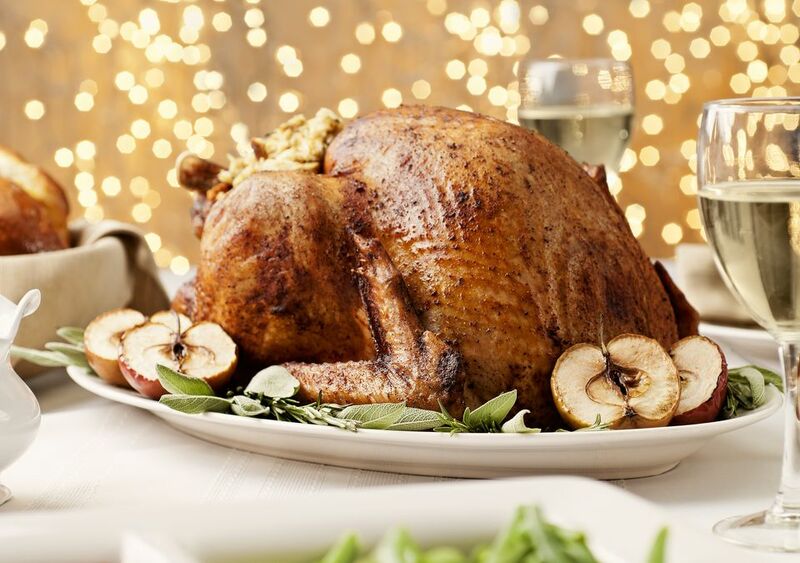 You also may come across a few different choices when it comes to whole turkeys: fresh or frozen, organic, free-range, or kosher, brined or seasoned. If you buy frozen, just remember to put the turkey in the refrigerator a few days before you plan to cook it—it will really take that long to defrost. In terms of organic etc., that is completely up to you as it will not affect how you cook the bird. 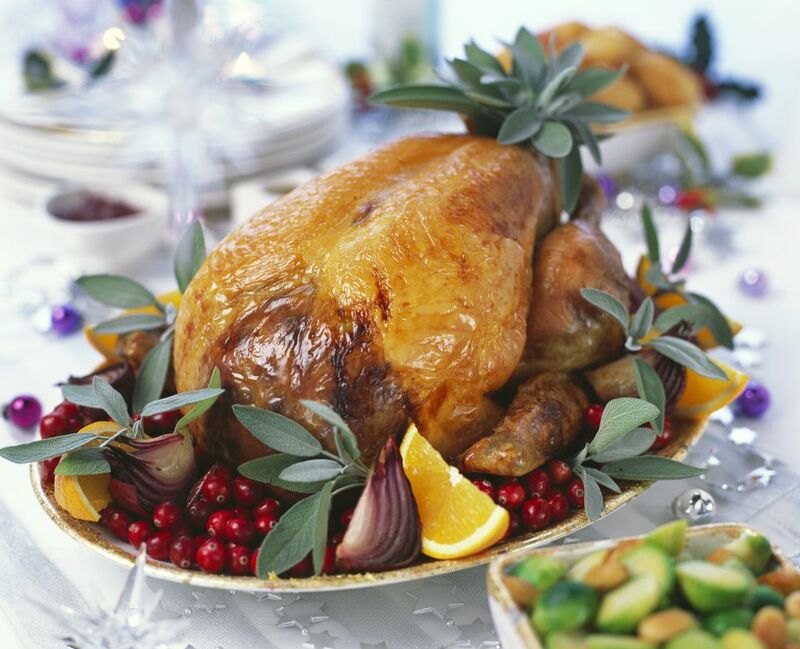 Since you are a novice, let's just stick to a plain turkey this time, so avoid any that are brined or seasoned. There really aren't a lot of equipment or ingredients needed to roast the perfect turkey besides the turkey and seasoning. The most important thing is that you have a large enough roasting pan. If you yours isn't big enough or you don't own one, you can purchase an aluminum roaster at the grocery store. Just be sure there is enough room around the bird and that it won't be touching the sides of the pan. One step listed here is to tie the turkey's legs together—if you choose to do this, you will need some kitchen twine, which you can find at the grocery store. Also, most turkeys come with a pop-up timer, but it is always helpful to have your own meat thermometer. These ingredients are for a 12- to 15-pound turkey. If your turkey is larger, you can increase the vegetables and herbs, and butter if you think you need more. Gather all of these ingredients and have at the ready. Before you begin, you need to prepare the aromatic vegetables by cutting the onion, celery, and carrots into large chunks. Let the butter soften to room temperature, or make a flavored compound butter, which is butter mixed with herbs and spices. Before you can do anything to the turkey, you need to clean it out and remove and move some parts around. First, discard the bag that contains the neck, heart, gizzard, etc. from inside the turkey, and rinse the turkey inside and out with cold water. Dry thoroughly with paper towels (this is very important if you want a crispy skin). Next, pull the wing tips forward and tuck them under the breasts so they don't burn. This also keeps the turkey sitting nice and straight. Tying the turkey with twine is called "trussing" and has been done for generations. It was believed that it helped the bird cook evenly, but, in fact, some chefs believe the opposite, saying the trussing stops the hot air from circulating around the legs. What chefs do agree on is that tying the legs makes for a prettier bird, so if that is important to you, then secure the legs to each other using kitchen twine or plain dental floss. The way to get a flavorful turkey is to season the meat as well as the skin. The only way to do that is to get between the breast skin and meat with your hands. Start with your fingers, and then, if you like, switch to a thin silicone spatula to push under the skin to separate it from the breast meat. Be careful not to tear the skin, although it's fairly tough so if you push slowly and firmly you should be able to separate the skin about 2/3 of the way down on either side of the breastbone. Whether you are using plain butter or a compound butter, spreading it between the skin and meat will make for a juicy and tasty bird. Place about 2 tablespoons of butter under the skin of each breast. Use your fingers on top of the skin to push down and spread it evenly toward the front of the turkey. Add the rest of the aromatic vegetables to your roasting pan and set the turkey on top. The vegetables will act as a sort of delicious rack. Add about a half-inch of liquid (water or stock) to the roasting pan. This will keep the oven moist. Also, the pan drippings will be even more flavorful if you're planning to make gravy. With all that butter there is a high risk of the skin burning, so covering the turkey with foil for a portion of the cooking time is necessary. Fold a piece of foil large enough to just cover the turkey breast. The foil should cover loosely—there is no need to press the foil down onto the butter. About an hour before the cooking is done (see next step for times), remove the foil to brown the skin. Now it's time to get that bird in the oven. Roast at 325 F for approximately 15 to 20 minutes per pound. This is just an estimate so be sure to use a meat thermometer to get a perfect doneness. Remove the turkey when it reads 165 F in the thickest part of the thigh meat. While roasting, the liquid can be used to baste the turkey (there is a debate whether basting does anything, but it's part of the tradition). Letting the turkey rest not only gives you time to finish the gravy and the remainder of the meal but also allows the juices in the turkey to redistribute, which is the secret to moist, tender meat. When you remove the turkey from the oven, cover it very loosely with foil and let it rest for at least 20 minutes. Don't worry, it won't get cold—a covered 20-pound turkey will stay hot for over 40 minutes, so don't rush it. Once the turkey has rested, it's time to ​carve that turkey.